This entry was posted in Can, Cask, Craft Brew, Russian, Stout by Guido. Bookmark the permalink. Here’s my quick summary of the imperial stouts we shared for Guido’s birthday / #stoutday. The first one we opened was the Black Market Brewing “Black Hole Sun”. It is a Russian Imperial Stout weighing in at 15% abv and has a pronounced licorice taste up front, with a surprisingly clean finish. I was expecting it to be hot with alcohol, but it seemed quite smooth. Malty sweet as it warmed up in the glass. 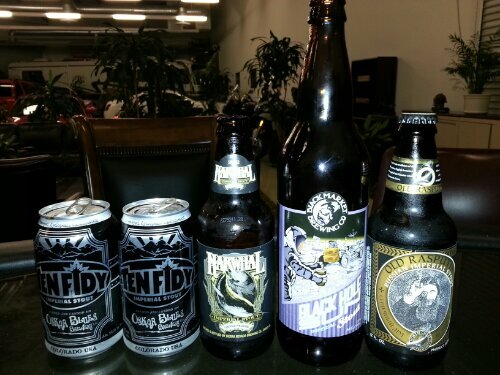 Next up was Ten Fidy which seemed watered down compared to the first brew. Rich dark malt flavors, seemed almost a bit smoky, not nearly as sweet. Third was the Narwhal, with more hops than either of the others. Refreshing to have some hop bitterness on palette. Could have had another one of those. Finally, Ol’ Raspy. Always been one of my favorite RIS’s. Good one to finish on, with just the right balance of malty sweet and bitter chocolate flavors. Happy Birthday Guido! Who is Guido? Is he related to Chico?